Poking around 19th century British newspapers–particularly those published in larger cities–one cannot but be struck by the number of notices for “missing persons.” Lloyd’s Weekly even went so far as to devote an entire column to these poignant ads in the 1890’s, a column so popular that it helped persuade Chief Commissioner Sir Edward Bradford of the Met to ask the Strand Union Board of Directors to keep records of people coming and going at the Bear Yard workhouse, which had been “found to be the resort of many wanderers of all descriptions.” The hope was that the Met would be able to use the receiving ward book as an easy way to answer requests for help “from the Colonies, as well as from all parts of the United Kingdom.” One might imagine that Sherlock Holmes made some use of it as well, and who know but that some of the records are not actually those of various unfortunates, but of the Great Detective in disguise. 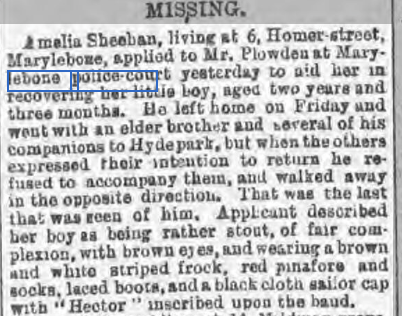 While it’s possible that a younger Holmes used the missing persons notices to scrounge up cases, by the time Lloyd’s began running its column, he likely scanned it, but only took notice of those which pertained to a current case, or which carried with it a whiff of the outre. Likely he was able to tell, with just a glance, who had run off to Australia, who had eloped with her unsuitable boyfriend, who had been coshed in the head and tossed into a canal, and who was likely resting in a newly-dug flower bed or under a cellar floor. Being just as curious but not nearly as clever, I decided to take a few cases from Lloyd’s column and do my own detective work, this time with Ancestry.com and the British Newspaper Archives Online just to see if I could find out what had happened to some of the “Missing.” It was a great deal of painstaking fun, with some solutions more obvious than others. First of all, I did a newspaper search for “Hector Sheehan,” just in case he had been found shortly after, and someone had seen fit to report it. There were no results found. I then went over to Ancestry.com and searched again for “Hector Sheehan,” this time with the name of his mother, his approximate year of birth (I gave it a leeway of +/- 2 years), and that he had lived in London, England. Again, no “Hector,” but remember, that was the name on the cap, and not necessarily the name of the boy. 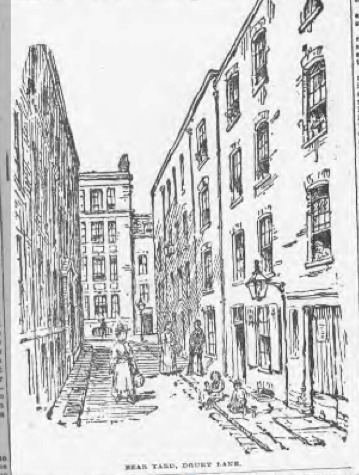 The Sheehans lived in Montague Mews North, #5, Upper George Street, Marylebone. 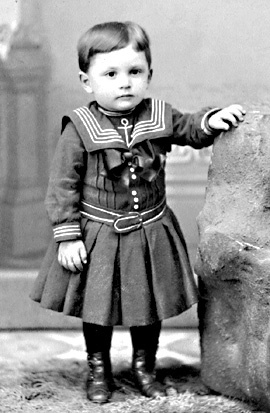 Their son Henry was just the right age to have gone missing in Hyde park at the age of two in 1895. One thing that bothered me about Mrs. Sheehan’s report was that her toddler son’s older brother left him in the park when he refused to go home. That made no sense to me–surely any half-way responsible brother would have known to just pick up his sibling, or drag him out of the park, and would never have simply left him. I was however, assuming that the older brother was old enough to be half-way responsible. If we have the right family here, Henry’s older brother would only have been around four years old–certainly not old enough to haul a determine toddler home, and likely not even old enough to realize that leaving the little boy there was dangerous. It is very possible, of course, that this is not the correct family, that Amelia Sheehan’s young son was never found, and that the family is one of those which eludes all sorts of official records. The census was, after all, taken once per decade; it was perfectly possible that the Sheehans moved in and out of London without ever being listed. Still, I’d like to think that, no matter what the name on his hat, the little boy was Henry Sheehan, and he was brought home safe and sound.